Ryobi 16' Gas chainsaw, perfect chainsaw for your wife! The spray was solid though, so you will NEED protective eye wear for this. Trust me, don’t try it without. PUT ON THE GOOFY GLASSES. I didn’t wear chainsaw pants, but based on my husband’s angst as I was bucking up a tree, I may find a pair wrapped up for my birthday. 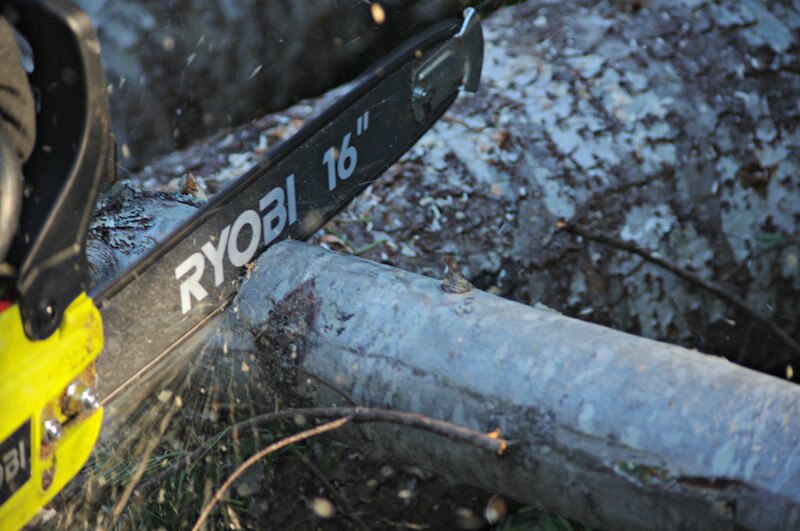 In short, the Ryobi 16′ Gas chainsaw performed well. It is yet another Ryobi staple we have on the farm, and I have to say, it is nice to have a manageable gas saw around. There is NO WAY I could manage my husbands beast of a machine, and in a pinch, I can assist with trees down, or worse if needed. Could this 16′ take down a full size tree? No. But it can make short work of taking down a smaller one, or helping to clean up and square up a big one. We believe in a tool for every purpose… and there is definitely a lot of uses for this saw. Available in Home Depot stores across the country!